The Jana Andolan Party today took to the streets in support of Gorkhaland and condemned alleged atrocities by state police on the people of the hills, including the raids on Bimal Gurung's house and his party office. The Harka Bahadur Chhetri-led JAP also sought to corner the BJP, by asking it to come good on its promise to fulfil the aspirations of the Gorkhas. 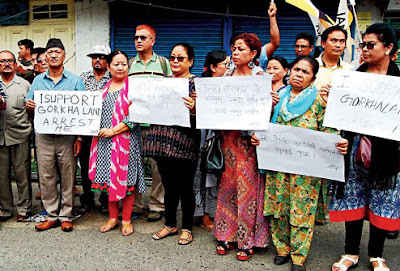 A group of JAP activists held a silent demonstration in front of Kalimpong police station for little over half-an-hour, holding placards in support of Gorkhaland and assailing the state government for the alleged police atrocities. Chhetri, who also took part in the demonstration, held a placard which read: "I support Gorkhaland. Arrest me." Another placard asked: "Is the state government above law? Does the law not apply to it?" Speaking to reporters earlier, the JAP president said the manner in which the police had conducted raids on the house of Morcha president Bimal Gurung and his party office yesterday was not acceptable, especially since he was also the chief executive of the GTA elected by the people of the hills. "The JAP very strongly opposes the manner in which the state government used the police administration (in conducting raids on Gurung's house in Patlebas, near Darjeeling town)... we feel great injustice and excesses have taken place...Arrows, khukris, furrows and spades were recovered," he said. Chhetri cautioned the state government against using the might of the police force to suppress the demand for Gorkhaland. "The demand for Gorkhaland is a constitutional demand, and it has to be met constitutionally...This is not something which will be resolved by using the police. If the police keep conducting raids, the people may keep quiet for some time, but eventually it will only strengthen their resolve for Gorkhaland...It is the responsibility of the state and the central governments to initiate steps towards forming Gorkhaland (to resolve the problem once and for all)," he said. Chhetri fired off a letter to BJP president Amit Saha on the present situation in the hills, reminding him of his party's promise to solve the problems of the Gorkhas, on the basis of which the people of the hills elected two BJP members as MPs. "These long-pending problems can only be solved by the creation of a separate state...The time has now come to for the BJP to make good on those promises," he said. Chhetri said for starters, the BJP should adopt a political resolution in favour of Gorkhaland through its national executive. "All other political and legislative steps flow from this crucial resolution to be first taken by your party."